Bootlegs Manager is an application for Windows that can help Iron Maiden bootleg traders manage their bootleg collections easily and efficiently. It was written by BoBo during June 2003, and went on general release in August 2003. The program is licenced as bootware, meaning that if you like and use the software you should send the author (BoBo) a bootleg of his choice every two years to support continued releases and improvements. If you're a trader from the DC Hub though, registration is free. You should download the latest version to take advantage of bugfixes and new features that are added as the versions progress. Older copies are presented for archiving purposes only. Right click the area and click Add. This adds a space for a bootleg to your list, which has 10 fields to complete to get the entire information about your bootleg. Click on the yellow eddies head to get a complete listing of Iron Maiden bootlegs. 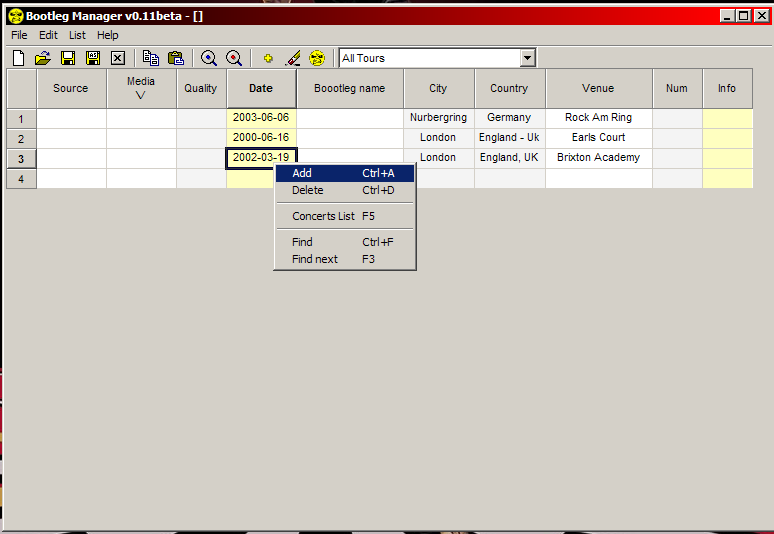 Once this has appeared, use the drop down menu to select the tour your bootleg is from. 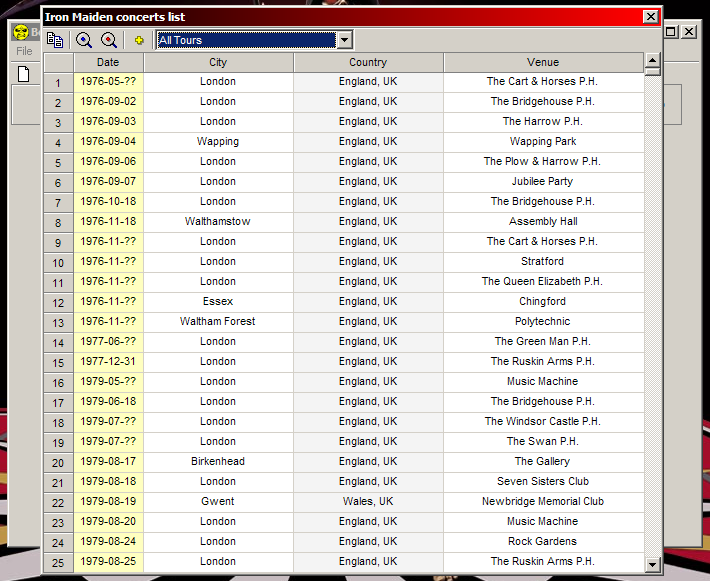 Once the tour list has appeared select the Concert you have and click the plus button to add it to your bootleg list. Close the Tour List and go back to your bootleg list. Select the source box and choose from the menu where your bootleg came from, repeat this for File Type and then fill in the quality and Info boxes. Once the above steps are done, repeat until your catalogue of bootlegs is complete. Click the disk icon at the top of the application, this will automatically save the file. If you would like to save the file to a different filename use the icon of a disk with AS in between, this will automatically open the "Save As" dialog box and you can rename your file list there. If you have text on the clipboard you want to put into your bootleg list, simply select the field you want it to go in and use the Clipboard Icon at the top of the application. To put something into the clipboard from the Bootlegs Manager application , again select the field you want the information to be copied out of and use the Paste icon at the top bar of the application. To remove a bootleg from your list, select it and use the erase icon at the top of the application or right click on it and delete it. You can search through your catalogue by using the Magnifying glass icons at the top of the application or selecting Edit --> Find Next to search for the bootleg you are looking for.